Palestinians protest as tear gas fumes erupt near the border with Israel, east of Khan Yunis, southern Gaza Strip, May 15. COLUMNS The West foisting Zionism on the Palestinians! The 1967 Six-Day War anniversary is upon us once more and there is no end in sight to Israel's unrelenting crimes against Palestinians. On June 5, 1967, Israel launched preemptive attacks that swiftly destroyed the Egyptian air force and moved into Gaza and the Sinai Desert. This was followed by a campaign in the West Bank and Jerusalem as well as a quick attack on the Golan Heights, which brought historical Palestine into Israeli hands. The events of 1967 brought the Palestinians into another cycle of displacement and movement out of historical Palestine. For some, this was the second time they had lost their homes and had to seek refuge in another country. What started as an idea to create a Zionist State in 1897 culminated with the 1948 Nakba and the 1967 Naksa, two major events that rendered the Palestinians stateless and under the constant threat of Israel's military attacks. 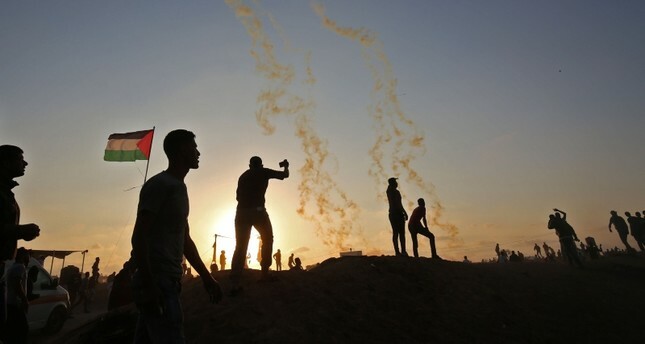 More than anything, the ongoing Israeli attacks and murders in Gaza and the strangling of 1.8 million Palestinians in the narrow strip of land are directly connected to the 1948 Nakba and the 1967 Naksa. Gaza's Right of Return March shed some much-needed light on Palestinian refugees' plight and the demand for implementation of the U.N.'s Resolution 194, adopted in the aftermath of the 1948 Nakba. Starting in 1947, the Zionist campaign to terrorize indigenous Palestinians out of their homes and lands resulted in the massive expulsion of some 750,000 Palestinians, the destruction of 561 villages and towns, and creating the refugee problem. Dispossessing Palestine and its population is at the core of the Zionist project and has been contemplated by Theodor Herzl and leaders of the Zionist movement from the beginning. The ongoing torment and targeted killings directed at Palestinians in Gaza and all over Palestine is constitutive of Zionism and not incidental or in response to security threats. "Israel having the right to defend itself" and "no country will allow threats on its borders" is the tired refrain coming from Israel's spokespersons and Western apologists for the Israeli military. A settler colonial occupying power that continues to dispossess and kill the indigenous population cannot claim self-defense against an imprisoned and totally controlled population. Let's go back to the 1967 events, the Six-Day War, and clarify that the genesis was set in motion before, during and in the aftermath of the 1948 Nakba. The forceful expulsion of Palestinians caused the concentration of refugee populations in the West Bank, Gaza Strip and Lebanon, while Israel continued to prevent them from returning to their homes, lands and properties. Furthermore, Israel worked to prevent the emergence of an independent Palestinian state by colluding with Jordan and allowing the annexation of the West Bank to Jordan, while Farouk's Egypt got the Gaza Strip. Israel's spokespeople correctly assert that no Palestinian state was permitted to emerge under the Arab rule, which is accurate but only half true since it was the Zionist leaders that worked with Arab and Western leaders to prevent such a development. The record of collusion across the Jordan River dates back to the early formation of the Transjordan and the agreement signed with the Zionists in 1922 that recognized the creation of the Zionist Jewish state in return for the emergence of the new Emirate on the eastern bank of the river. More precisely, the Jordan-Israel relationship was formed in the aftermath of the San Remo Peace Conference which was held in April 1920 to determine the final boundaries for areas captured from the Ottoman Empire in World War I. Attendees at the conference included Great Britain, France, Italy, Japan and the Zionist Movement represented by Chaim Weizmann and Nahum Sokolow, as well as Herbert Samuel who presented the Balfour Declaration at the meeting and the United States only as a neutral observer. At this gathering, the modern boundaries of the region were set and Palestine was presented as a "Jewish Homeland." However, the area east of the Jordan River, including the Hijaz Railroad line, was presented by the Zionist's map as constituting part of their settler colonial state. Between 1947 and 1948, Zionist-Jordanian diplomatic relations were directed at preventing the emergence of a Palestinian Arab state. Regarding this, the important work of Avi Shlaim, "Collusion Across the Jordan: King Abdullah, the Zionist and the Partition of Palestine," is a must-read for understanding the coordination and negotiations between Golda Meir and King Abdullah in 1948 to prevent the emergence of a Palestinian state and agreeing to a divided Jerusalem as the better option to having it under an international governing structure. The Zionists were not content with only the dispossession and expulsion of Palestinians from the 1948 areas but also had to make sure that no sovereign Palestinian state with political rights emerged in the remaining parts or allowing entry into the area of an international authority to oversee Jerusalem. Zionism and Israel are centered on permanent denial; the existence of Palestine and Palestinians is not to be allowed as a concept or in political terms. The denial extends to refusing to even call the Palestinians, who are Israeli citizens, Palestinians; rather insisting on referring to them as Israeli Arabs, Druze or Bedouins. Zionism and Israel suffer from compounded denials: The denial of the dispossession of the Palestinians, denial of their existence, denial of the right of return, a denial of political rights and a pernicious denial of responsibility for what has unfolded in Palestine.